Ohuhu 10 Telescoping Marshmallow Roasting Sticks are wonderful! Ohuhu 10 Telescoping Marshmallow Roasting Sticks are the perfect length for roasting marshmallows and I love that they are colorful. The bamboo handles fit comfortably in my hand and are even easy for my kids to hold. 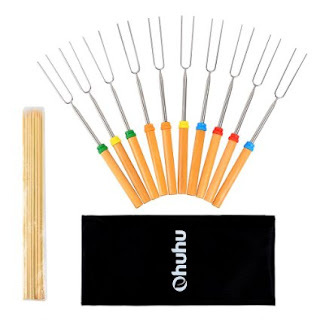 I also love that these Ohuhu 10 Telescoping Marshmallow Roasting Sticks are stainless steel so they won't rust and clean up easily. I also really like that they're collapsible and come in a handle easy to store travel bag. Ohuhu 10 Telescoping Marshmallow Roasting Sticks are the perfect roasting sticks and I highly recommend them!